Malaysiakini : COMMENT | The former prime minister Najib Abdul Razak has issued a statement criticising the present government’s announcement that our debt is now RM1 trillion. He said it “will just unsettle the financial markets, alarm the credit rating agencies and investors' confidence in our institutions, such as our Bank Negara Malaysia”. We would like to explain that the new government will carry out our administration based on the principles of competency, accountability and transparency (CAT). We want to establish the true baseline on the state of financial affairs, diagnose the problems and then prescribe all necessary remedies. Let me take this opportunity to explain the RM1 trillion worth of liabilities as of Dec 31, 2017, as previously announced. 1. The official federal government debt is RM686.8 billion (50.8 percent of the gross domestic product, or GDP). 2. In addition, the government is already committed to paying for government guarantees for various entities that are unable to service their debts. This amounts to RM199.1 billion (14.6 percent of GDP). The committed government guarantees would include entities such Danainfra Nasional Bhd (RM42.2 billion), Govco Holdings Bhd (RM8.8 billion), Prasarana Malaysia Bhd (RM26.6 billion), Malaysia Rail Link Sdn Bhd (RM14.5 billion) as well as an estimated RM38 billion for 1MDB. 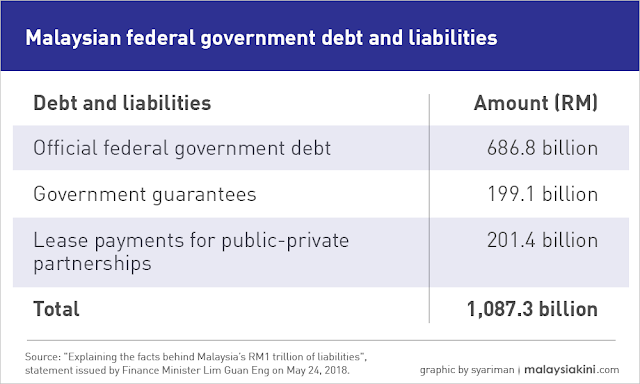 Based on the two items above, the federal government debt would amount to RM885.9 billion. This represents the 65.4 percent of the GDP as highlighted by Prime Minister Dr Mahathir Mohamad yesterday. 3. However, in addition to the above, the federal government is also committed and obligated to make lease payments (including rental, maintenance and other charges), for a whole list of “Public-Private Partnership” (PPP) projects such as the construction of schools, hostels, roads, police stations, hospitals, et cetera. The lease commitments which were designed specifically to circumvent the federal government guarantee and debt limits amount to RM201.4 billion (14.9 percent of GDP). Hence, the federal government debt and liabilities amount to a total of RM1,087.3 billion or 80.3 percent of the GDP as of Dec 31, 2017.